sensor element mounted on a servo. The sensor is the black turred mount on the front of the robot. detected on the right it will turn left. Nothing more complicated than that. wheel on the right backward. The brain of Roamer is an ATMEL AVR AT90S8515 microcontroller programmed completely in assembly. 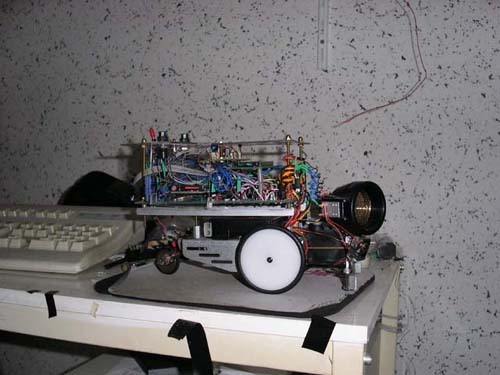 This chip controls the complete bot: Sensors, display, locomotion, behaviour etc. other three robots are are described there.